Apart from the Nokia N8, the other most anticipated Nokia device to come into the market in recent months is the business oriented Nokia E7. Having seen an early rendition of the device way back even before the iPhone 4 was launched, we noted that the prospect of having a device that has all the capabilities of the N8 with the added useful utility of a physical keyboard is something to look forward too. 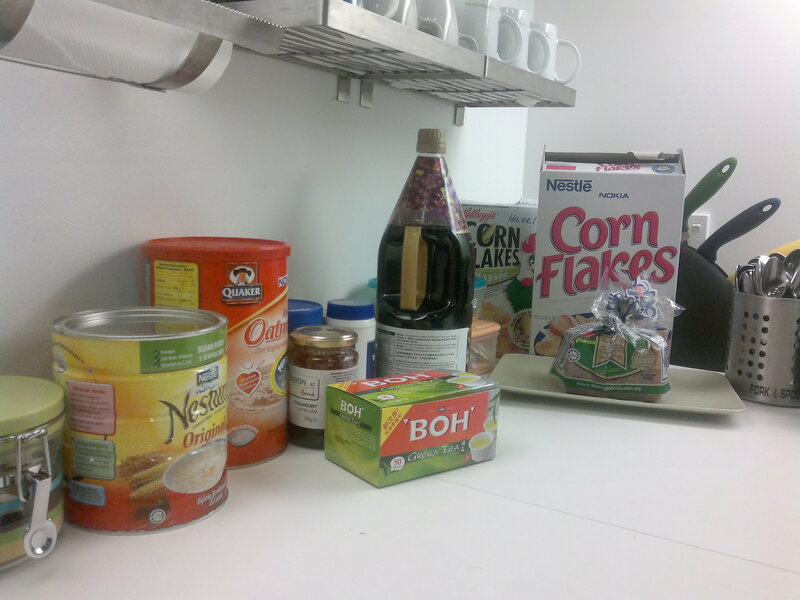 But the scenario is decidedly different now. In a last ditch effort to remain relevant, Nokia jumped off the platform and right into bed with Microsoft at the expense of many die-hard Symbian fans who, for the lack of a better word, feel like they were cheated out of a long standing relationship. So now that we know Nokia will be focusing its effort on churning primarily Windows Phone devices what is the outlook for the E7 — what can be considered as a last of its kind device? Dubbed as the spiritual successor of Nokia’s last rendition of its communicator series, the E90, can the E7 establish itself as a formidable business oriented machine in a sea of business-centric devices coming from Android, BlackBerry and iPhone? 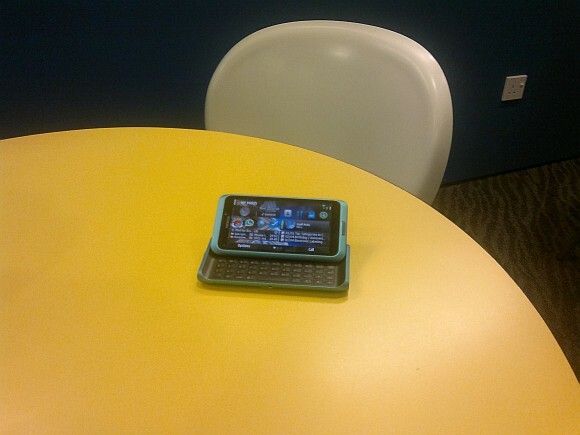 This is our first impression of the Nokia E7. In our Nokia N8 first impression we mentioned that it is one of the most handsomely designed mobile phones we’ve seen and the Nokia E7 carries on with that tradition. We like that Nokia took the same design route with the E7 but with enough refinements to set it apart from it’s stablemate the N8. Like the N8, the E7 wears a sharp primarily aluminium suit with crisp lines mixed with curves at all the right places. Where BlackBerry has tried to stick to a similar design DNA across all of its devices, the Nokia E7 is a refreshing design standout in the realm of business phones. From a design perspective it is a phone that you want to be seen using, dare we say, even more than the ubiquitous iPhone 4. 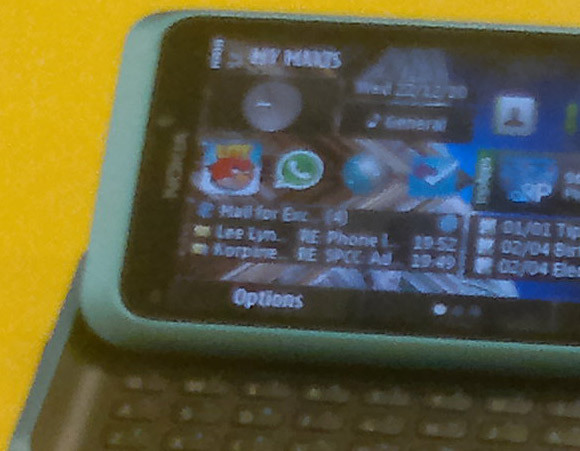 Some of the minor design tweaks on the Nokia E7 include a menu button that is now slightly redesigned and repositioned to the centre as opposed to the off-centre location of the button on the Nokia N8. We noticed that the button is also now bigger and protrudes just that little bit more compared to the one on the N8 to offer a more robust and tactile feel. Where the Nokia N8 featured an industrial-ish design with exposed Torx screws and a protruding camera enclosure to house the massive 12MP camera, the E7’s exterior is more “finished” with no exposed screws or protruding camera enclosure. No protruding camera enclosure is a good thing as the E7 rests less awkwardly when placed on a table compared to the N8 but as a trade-off you don’t get a whopping 12MP camera at your disposal. Instead, you get a 8MP primary camera and a flat back panel. Other than that, the locations of the various ports and slots have been moved around as well. 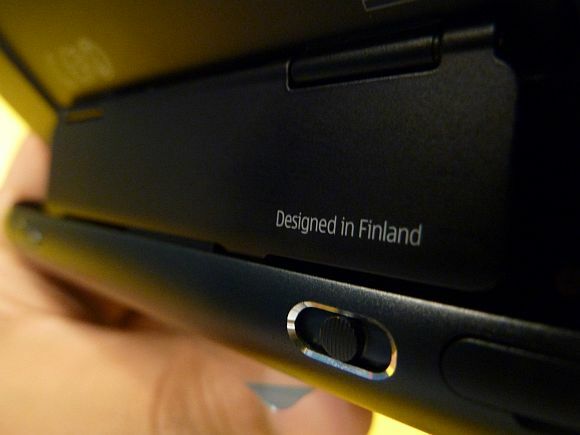 The micro-USB port, which sits on the right side of the Nokia N8 is now located on the top part of the Nokia E7 along with the HDMI port and the 3.5mm heaphone jack. Where the Nokia N8 offered two charging options, one via micro-USB and the other using the more traditional Nokia 2mm charging interface, the E7 does away with the Nokia standard charging head and uses micro-USB as the only charging method. We’ve made it a point to note in our Nokia N8 review that having a redundant charging input is, well, redundant when you consider the fact that almost all other devices have opted for micro-USB as the new charging standard and we’re happy to see that Nokia has made this change on the E7 as well. We’re always very particular about where the data and charging port of a device is because let’s face it, there will be a point where you will need to use the phone while it is being charged. Having a data/charging port placed where it becomes a hindrance when a smart phone is being used is one of the biggest annoyance that we have with some of the newer smart phones and the Nokia E7 does not escape this. Yes, on the E7 the micro-USB port is located at the top and in most instances, this would be fine if you’re using the device primarily in portrait mode. But with the physical keyboard on the E7, you will use it more in landscape mode, and when oriented this way, you’ll quickly realise that the micro-USB gets in the way for you to be able to comfortably use the device. This is a fairly obvious design flaw and we can’t understand how this could be an oversight on Nokia’s part. Having the port right up there really hinders the usability of the device. 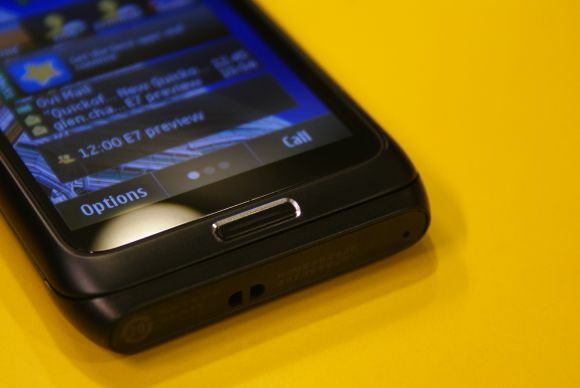 On the left side of the E7, you get the screen lock slider and on the right side is the volume slider along with a dedicated camera button and the SIM card slot. One thing we’d like to note with the SIM card slot on the Nokia E7, it is so much easier to pry open compared to the one on the N8. 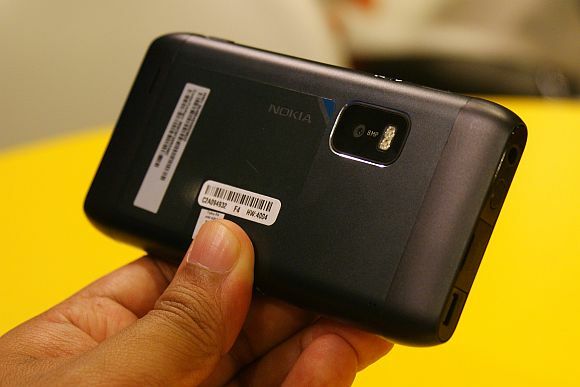 Yes, the SIM card slot is located externally just like the Nokia N8, which also means that the battery on the Nokia E7 is not user replaceable. If you want to get the battery replaced, you have to take the E7 to a Nokia service centre. For those eco-conscious mobile users out there you’ll be happy to note that the Nokia E7 is one of the most environmentally friendly phones to come out from the Finnish company. Save for the 8MP camera, there is really not much separating the Nokia E7 with the Nokia N8. Internally the E7 is powered by the same ARM11 680MHz processor and 256MB RAM with a dedicated GPU as the N8. Less than 700MHz in a flagship phone does sound a bit inadequate when you consider that competitors are already putting into the market devices with dual-core 1GHz processors. This could be a factor for some buyers. But if we’re being terribly honest, the lack of processing power is only ever felt when you have over five applications running simultaneously in the background. This means that you have to be more diligent in your app usage and remember to completely shutdown apps after you’re down with them. Granted, this is a bit more tedious but even with 1GHz processors if you don’t manage your apps usage properly, you’re going to experience some lag. Having said that, a slower processor will also mean that the apps you can run with the E7 is not as rich as what a 1GHz device can run. The Nokia E7 comes with 16GB of on board storage space but there’s no hot-swapable Micro SD slot so that means you’re stuck with whatever memory you have in the device. 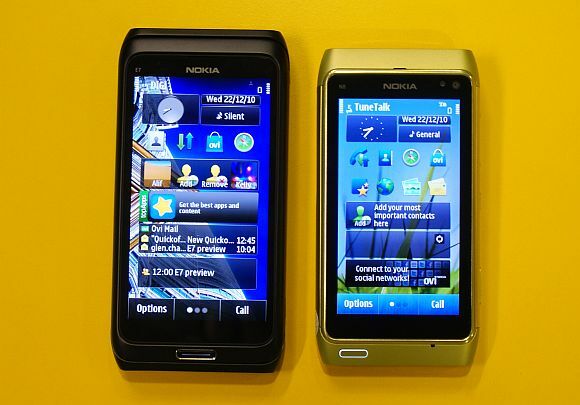 Like the N8, the Nokia E7 supports “thumbdrive on the go” as well which means you can easily transfer files in the E7 to an external storage device via USB. As with the Symbian 3 OS. 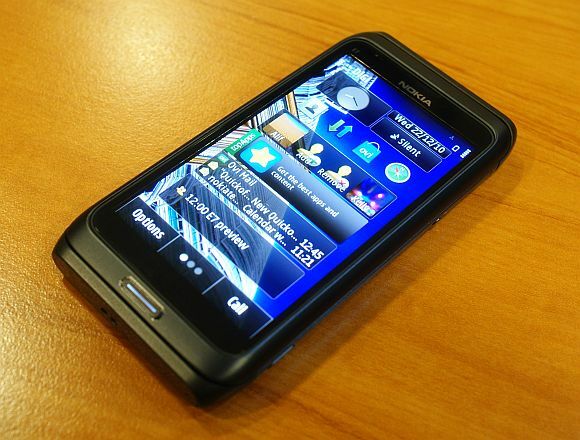 Nokia has introduced some enhancements in E7 mostly to support the business functions of the device. Anticipating that the typical E7 user will require VPN and easy access to intranet, Nokia has made setting up for these feature fairly easy, and that’s pretty much it. To us however, Symbian 3 is still a bit of a hit and miss. It has its good side but it’s not without its bad sides as well, and considering that Nokia’s priorities are now more towards developing Windows Phone devices, there is really very little point in debating about the future of Symbian in Nokia’s flagship devices. Having said that, the E7 boasts solid security features befitting its business role like a proprietary anti-theft and remote locate application powered by FSecure which gives you the capability to remotely locate your phone if it ever gets lost of stolen. With the app you can remotely wipe all the data in your phone as well. In addition, you have the option to remotely lock your phone, so that no matter what anyone tries to do with it, the phone is rendered useless unless it is returned to its owner. Another strong feature provided by the FSecure application is that the Nokia E7 can discretely send an SMS notification in the event that the SIM card is swapped. In terms of usability, the Nokia E7 is not difficult to get used to but like our previous complaints with the Symbian 3 OS, it still lack the contemporary feel of the Android and iOS platforms. Again, considering that Nokia is now more focused on developing Windows Phone devices, it’s probably good advice for those waiting for more improvements to come to the Symbian 3 platform to not hold their breaths. 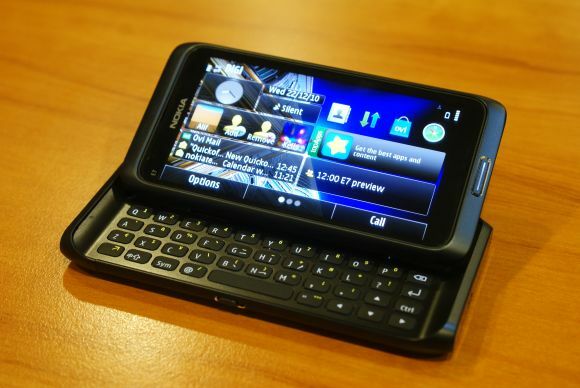 The Nokia E7 features a 4-inch AMOLED screen with Nokia’s ClearBlack technology which promises better visibility under bright sunlight. 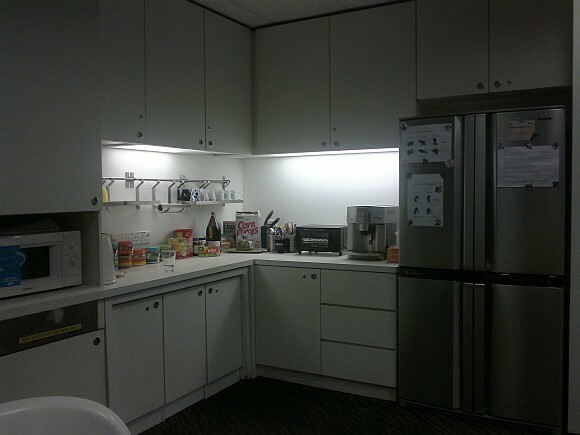 Comparing this with the 3.5-inch screen on the Nokia N8, there is no discernible difference between the two when viewed indoors under artificial light. We didn’t have the opportunity to really put the E7’s ClearBlack screen to the test under bright sunlight so we can’t say how much better it performs in those conditions but we can tell you that images on the E7 are as crisp as it’ll ever be this side of Retina Display. Overall, we have no complaints with the E7’s display. It’s clear enough for you to read emails and presentations on and deliciously vibrant and bright for you to watch videos all day long. With an 8MP sensor, the Nokia E7 has a decent camera. 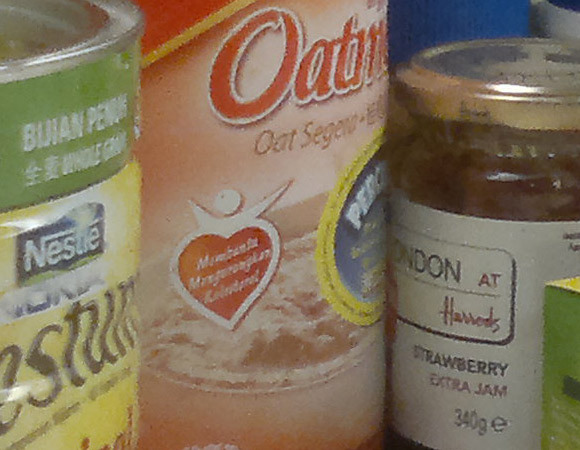 It does it’s job but colours appear washed out and details are not as sharp as we would like it to be. One major issue we have with the camera is the 50cm minimum focus point. At 50cm you can forget about taking macro shots with the E7. 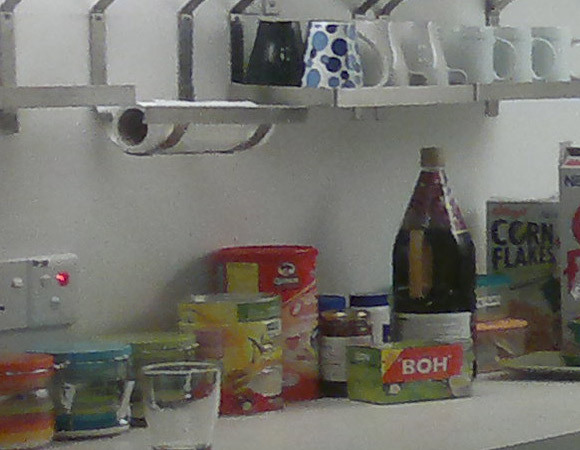 We’re perplexed as to the reason why Nokia made the lens on the E7 this way. One possibility is that being a business phone Nokia wanted to reduce the risk of secret documents being leaked out of mighty conglomerates by way of covert macro shots taken with the E7. It’s a long shot but it’s possible. So for those of you expecting stellar imaging performance from the Nokia E7 akin to the N8, we’re sorry to say that you’ll be disappointed. In fact as cameras come, the 8MP unit on the E7 offers a rather unimpressive performance when compared to its peers. 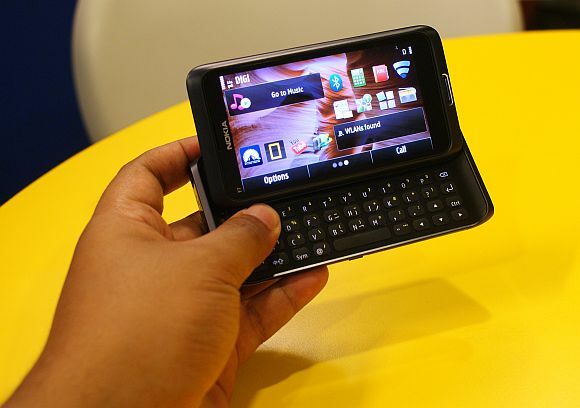 One of the main features of the Nokia E7 is the slide-out QWERTY keyboard. First up, the keyboard doesn’t present itself in the traditional slide-out manner. The specially designed hinge angles the screen considerably to make lengthy typing more comfortable and ergonomic. In terms of the tactile feel of the keyboard, it’s more comfortable than it looks. The ruberised keys are very nice to tap on and are very adequately spaced apart to make it very comfortable to use. The thing with phones that feature slide-out keyboards like the Nokia E7 is that the transition between landscape and portrait modes require an extra effort. Typically we use our devices in portrait mode and seldom change to landscape mode. So you can imagine if you get a lot of text messages or emails, constantly switching orientation to landscape mode and flipping out the keyboard can be a bit of a chore. But this is in no part the fault of the Nokia E7, it’s just inherent in all devices with slide-out keyboards. So this is not going to take marks off the E7. 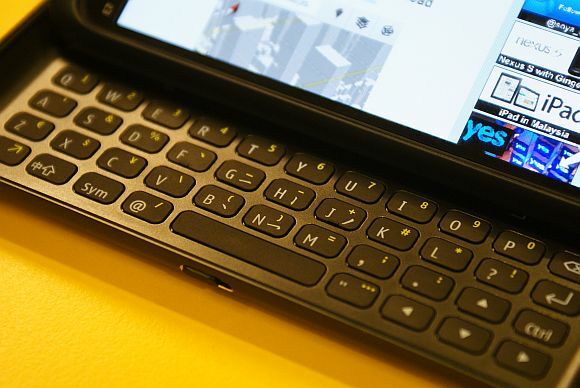 The keyboard is comfortable and for those who can’t live without a physical keyboard, the one on the Nokia E7 is one of the better ones that we’ve used. One gripe we have with the keyboard is the effort it takes to slide it out. The hinge mechanism is robustly built and takes a few tries to get right. So there is a bit of a learning curve but when you get used to it the keyboard come out willingly albeit still requiring a bit more effort that we would like. So the question remains is the Nokia E7 a formidable contender in the business smart phone segment? In our brief encounter, we can say “yes”. The E7 is good in the things that it needs to be good at and it has its strong points but it is not without its faults. Though we have to concede that the drawbacks are not the fault of E7’s hardware. The major drawbacks of the E7 lies in the shortcomings of the Symbian 3 OS. And as we’ve mentioned before, with Nokia focused on Windows Phone, it’s probably safe to assume that improvements for the Symbian 3 OS will be rare. So who would be the typical E7 user? For one, the Nokia die-hard will love the E7’s keyboard and vibrant 4-inch display. Those who want to stand out from the BlackBerry crowd can look here as well but is it enough to convince buyers? 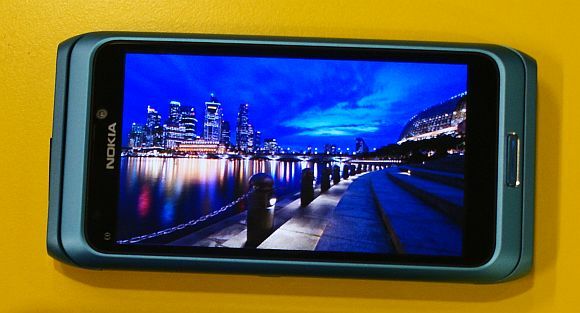 At RM1,995 you can’t deny that there are phones in the market are just as good if not better than the E7. While it’s not difficult to find a better phone in the market (one being the HTC Incredible S), the same can’t be said when it comes to justifying purchasing the E7 especially considering that the Nokia N8 priced at RM1,690 has one of the best cameras we’ve seen on a smart phone (with Xenon flash no less) and it includes an FM built-in FM transmitter. At the end of the day decision is on you. There is no shortage of capable phones that fall into the Nokia E7’s category and it all bores down to how much are you willing to pay and what will be your primary use for the device. For us however, as capable as the E7 is, we struggle to find its appeal all things considered. Got questions on the Nokia E7?